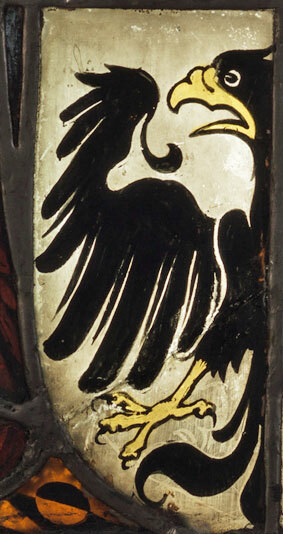 Silver stain is used on the Boppard windows and the details below are from the Siegfried von Gelnhausen panel – the top image highlighting the pages of a book and the bottom image colouring the beak and leg of the bird on the shield. The technique of silver staining has not changed over the centuries: The pigment is combined with other ingredients such as clay and Venice turpentine to help the mixture lay smoothly on the glass surface. This is then applied to the back of the glass (after the painted details have been applied to the front). The process of heating the glass and stain in a kiln creates a chemical reaction between the stain and the glass, causing an ionic exchange between the glass and the silver to produce a range of yellows on the surface of the glass. These can range from a pale lemon to a dark orange. 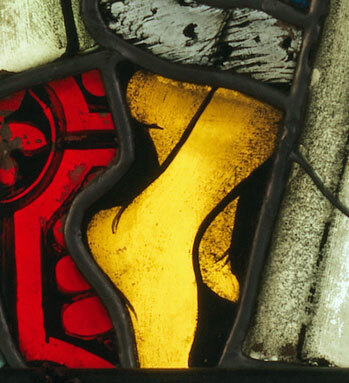 Unlike paint, which when heated becomes fused to the glass surface, the yellow stain actually becomes a part of the glass. Areas of stain can be applied to give hair colour, costume highlights, and to create details such as crowns and haloes, etc. 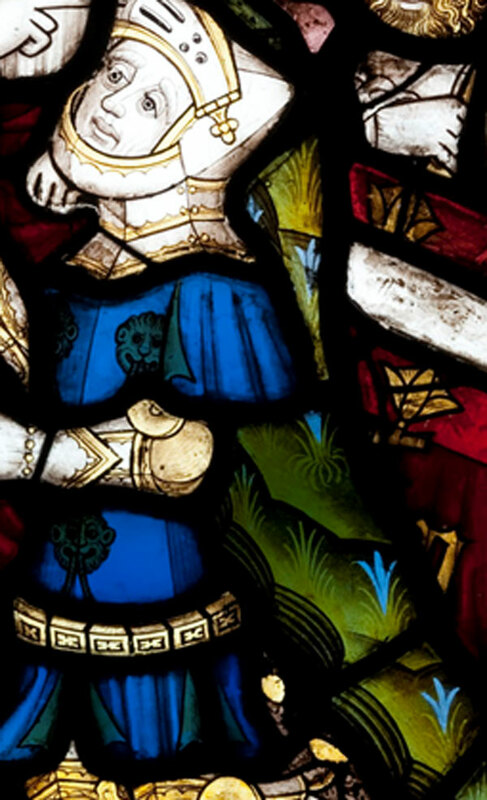 From about the 15th century it has also been applied to blue glass to create greens for such things as foliage – all without having to add extra strips of lead. A fine example of this can be seen in the 15th century panel St John the Evangelist Hands the Palm to the Jew, on display in the Burrell Collection (below). 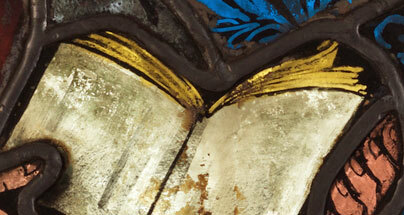 Detail of silver stain used on clear glass to create yellow and used on blue glass to create green. Many factors affect the colour of stain produced, including the chemical composition of the glass, the composition of the stain, length of time in the kiln, temperature of the kiln, the thickness with which the stain was applied etc. In the medieval period it was not an exact science as they didn’t have the same technology for controlling the speed and temperature of a kiln when firing as we do now. In the early days of using silver stain, the process of controlling the kiln temperature and all the other variables made silver staining difficult and expensive. Where possible, pot metal yellow glass would be used and silver staining applied only were necessary, as when you wanted just a patch of yellow on the glass section. The detail above is from the Boppard 8th Commandment panel – the feet picked out using black enamel paint. This can also be seen in the French panel above with a Saint writing, seated in a Gothic niche with cusped pointed arch; he is seated on a yellow throne facing left, pen in one hand and the other steadying the book propped in front of him, dated to the 14th Century. The top of the lectern, the beard and other details are in silver stain but the seat and other large yellow areas are pot metal yellow. As technology and experience developed, the cost of silver staining dropped and the cost of coloured pot metal glass increased. Because clear glass was so much cheaper than coloured glass small decorative clear glass panels using paint and stain became very popular, as can be seen in the two examples on display in the Burrell Collection, shown below. This is a very well-known and admired English Norwich School roundel dating to the 15th century, based on the “Labours of the month”. These were a monthly cycle of activities the peasants should be engaged in, such as; April – Planting and enjoying the country or picking flowers, May – Hawking and courtly love, June – Hay harvest, July – Wheat harvest, and August – Wheat threshing. 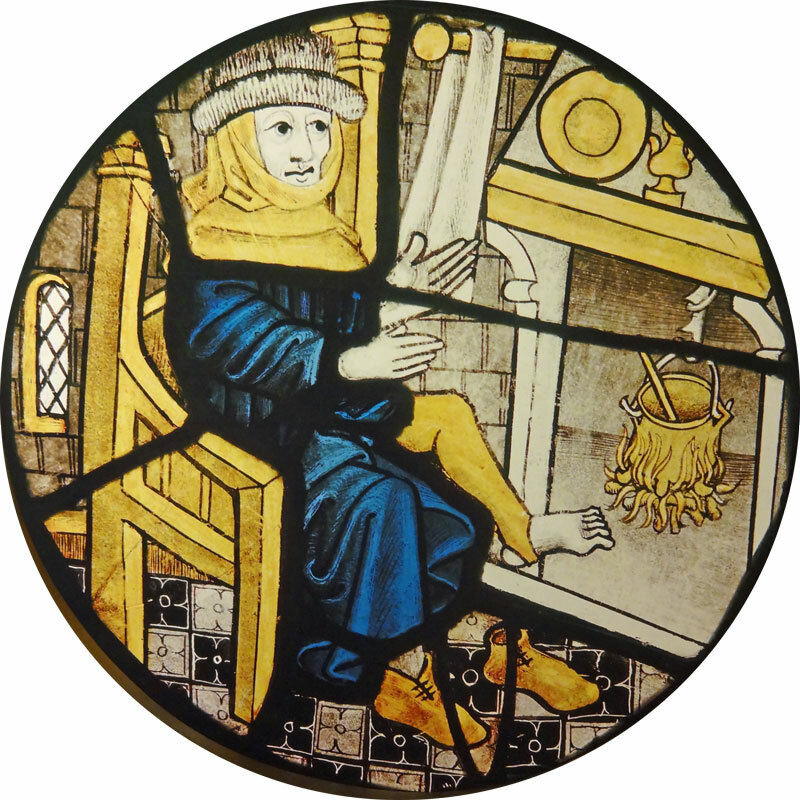 The roundel above shows February – a man warming himself in front of the fire! 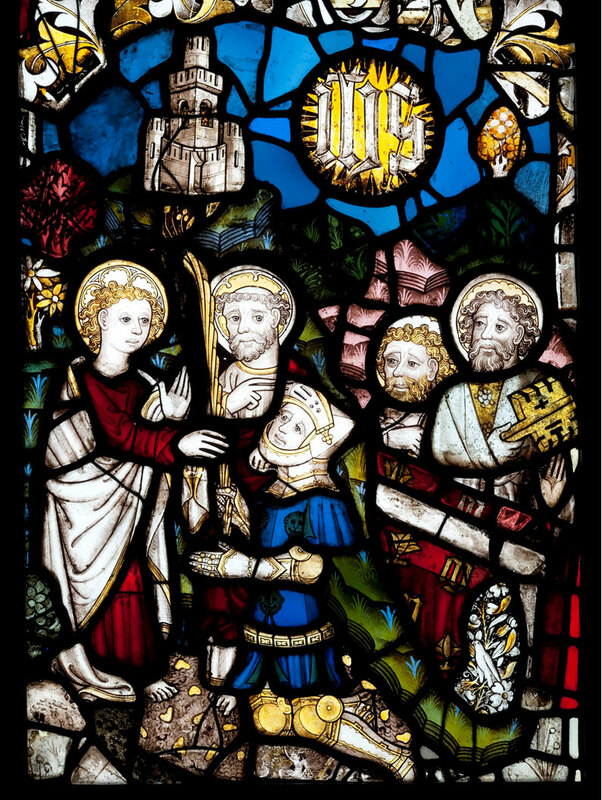 It is thought to be from the same set as three roundels of the later 15th Century in the Victoria and Albert Museum (September, October and November) which may have been originally in St. Michael-at-Coslany Church. Norwich. 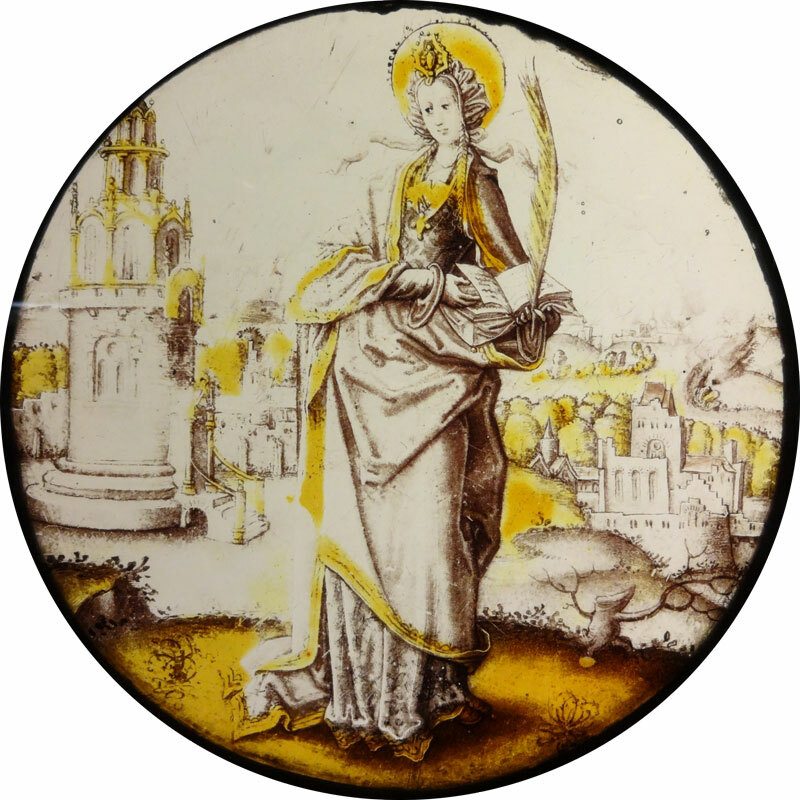 The roundel of St. Barbara above is Flemish, and was created in the early 16th century. St. Barbara is standing in a landscape, holding a book and feather; on the right is a tower (her main attribute), a round structure approached by a flight of steps with handrails and on the left, a fortress and church in a valley.